An armed man waves his rifle as buildings and cars at the U.S. consulate compound are engulfed in flames on Sept. 11, 2012, during an attack by an armed mob. A small team of Special Forces operatives was ready to fly from Tripoli to Benghazi last year after Libyan insurgents attacked the U.S. mission there, but was told it was not authorized to board the flight by regional military commanders, according to a career State Department official scheduled to testify before Congress on Wednesday. Gregory Hicks, then deputy chief of the U.S. diplomatic mission in Libya, told investigators for the House Oversight and Government Reform Committee that U.S. officials had persuaded the Libyan government to allow the Special Forces operatives to board the rescue flight from Tripoli to Benghazi. But an officer received a phone call telling them to stand down before they left for the airport, according to excerpts of his account made available to NBC News on Monday. That conversation occurred after the U.S. ambassador to Libya and another American had been killed in the initial attack, but hours before a second attack that killed two other Americans. Hicks quoted a Special Forces commander as telling him, "I have never been so embarrassed in my life, that a State Department officer has bigger balls than somebody in the military," referring to his willingness to authorize the mission. U.S. military officials confirmed Hicks' account late Monday, but said the team was reviewing security measures at the Embassy and was not equipped for combat. 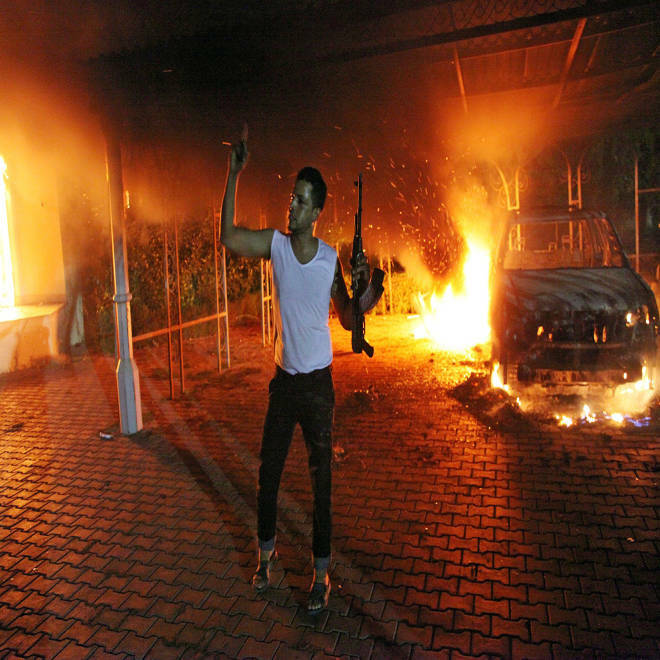 The Special Forces soldiers would have been the second group of U.S. government personnel to travel to Benghazi. Earlier, six Americans flew from Tripoli to Benghazi to attempt to aid the embattled personnel at the diplomatic mission. Sources told NBC News that Hicks told investigators that the team that was denied permission to fly to Benghazi consisted of just four Special Operations soldiers and that the flight did not arrive in time for their presence to have had an impact in the fighting. Two Americans, including U.S. Ambassador Christopher Stevens, were killed in the initial attack on the Benghazi consulate, which began just before 10 p.m. on Sept. 11. Two former Navy SEALs died in a mortar attack on a nearby U.S. diplomatic annex early on Sept. 12, shortly before the flight from Tripoli arrived. Hicks also said that the U.S. did not seek permission from the Libyan government to scramble aircraft to respond to the attack, saying he believed that the show of airpower would have intimidated the Libyan Islamists blamed for the attack. U.S. State Department spokesman Patrick Ventrell responds to sharp questioning Monday regarding expected testimony of Gregory Hicks, former deputy chief of the U.S. diplomatic mission in Libya, on whether officials declined to send assets to Benghazi during last year's consulate attack. Hicks said that the U.S. never asked permission from the Libyans to enter their airspace, believing Benghazi was too remote a target and that it would take two to three hours to get F-16s in the air. “The answer was, ’It’s too far away, there are no tankers, there is nothing that could respond,’” he recalled. The only U.S. defenders who arrived in time to battle the insurgents was a small group of men who chartered a plane in Tripoli after the initial assault on the Benghazi consulate and arrived in Benghazi by 1:30 a.m. on Sept. 12, in time to help set up a defense at the diplomatic annex. Ex-SEALs Glen Doherty and Tyrone Woods, were killed in a mortar attack on the compound between 5 and 6 a.m.
A Libyan C-130 transport plane that would’ve carried the second group of U.S. Special Forces operatives from Tripoli to Benghazi ultimately left Tripoli for Benghazi between 6 and 6:30 a.m., after Doherty and Woods were dead. It later evacuated survivors from the attack. Two separate U.S. Special Forces teams from elsewhere in Europe were ultimately authorized to respond to the attacks, but did not arrive at staging bases until the evening of Sept. 12, more than 12 hours after the fighting had ended. In addition to Hicks, the House Oversight and Government Reform Committee is scheduled to hear testimony from Mark Thompson, acting deputy assistant secretary for counterterrorism, and Eric Nordstrom, diplomatic security officer and former regional security officer in Libya. Both Hicks and Thompson are career State Department employees and described as “whistleblowers” because they say they fear retribution from senior State Department officials. Both the White House and State Department challenged the assertion that Hicks' testimony was new. NBC Chief Pentagon Correspondent Jim Miklaszewski and Pentagon Producer Courtney Kube contributed to this report.